Custom Medals| What Should You Foucs on When Ordering CUSTOM MEDALS? 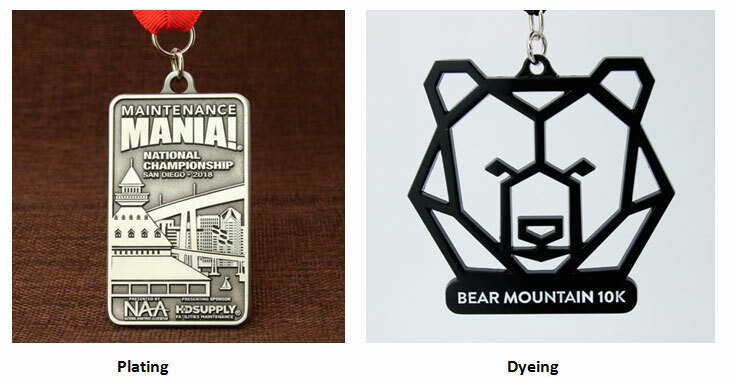 What should You Focus on When Ordering Custom Medals? When you are prepared to customize your unique medals, you must be confused about different crafts and how to choose them. 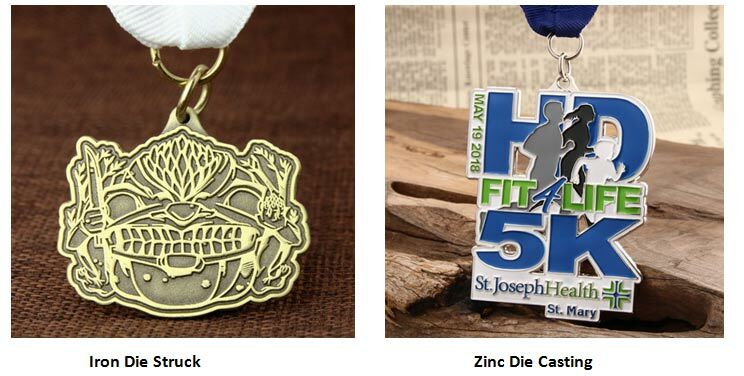 What should you focus on when ordering Custom Medals? Reading on and you will be clear about it. Basing on GS-JJ, There are some points that you need to know. Plating is the process of plating a thin layer of other metals or alloys on the surface of some metals by electrolysis. plating has some options. In general, it can be classified into two parts. One is shiny color like gold, nickel, brass, copper and black nickel. Another is antique color like anti-gold, anti-silver, anti-copper. These color looks like metal itself. Dyeing is the act of dyeing a substance by chemically or otherwise affecting the substance itself. You can choose any color what you want to dyeing like black, red and so on. Usually, soft enamel and hard enamel will use dyeing. Brass is used as raw material for hard enamel, while copper, iron and aluminum can be used as raw materials for soft enamel. The coloring materials used are also different. Hard enamel is a kind of color paste, while soft enamel is a kind of color paint. The concentration ratio between the two is different. Hard enamel is first plating, coloring, polishing and then plating again . The process of soft enamel is plating, polishing and coloring, which decides on their differences. The two kinds of enamels are baked at different temperatures. The surface of hard enamel is smooth, and the soft enamel is concave and convex. The pattern or text and color of the hard enamel badge are basically on the same plane, with the finger feeling there will be a little bump, but this is different from the feeling of the soft enamel. It is important to note here that the soft enamel will also be smooth when added with epoxy . Discrimination skills: epoxy added can have the light refraction and the feeling of reflecting light. Generally speaking, hard enamel is expensive than soft enamel because of their different process. Hard enamel usually are more delicate than soft enamel. The price of soft enamel varies according to the material used. For example, the price of the iron soft enamel is very affordable and is chosen by many people. Notes: Hard enamel usually doesn’t dyeing black but can plat black nickel. When metal layered, it can’t use hard enamel or sandblast. There are three main texture used. Iron die struck is matched with soft enamel; Brass die struck is with hard enamel. Zinc die casting is a metal casting process that is characterized by forcing molten metal under high pressure into a mold cavity. Zinc die casting is expensive, but when the shape is complex or cut out or size is bid, it only uses Zinc die casting. 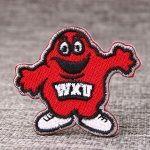 The four prints as follows are widely used in custom lapel pins, and the last one are used in the custom medals. Both of them should be paid additionally. Silkscreen print is to use the screen as the substrate, and through the photosensitive plate making method, making silkscreen print with pictures and text. If your texts of products are small or the design is complex, manufacturer cannot make it by using model. GS-JJ usually uses silkscreen print to show its effects. It needs to be emphasized that the text and pattern of silkscreen is self-colored. For example, red texts and blue logo. But there isn’t gradient pattern. In addition, because offset print can be used in the plane, silkscreen print will be combined with hard enamel to finish the needed design and achieve the desired effect in general. If your product needs to dyeing many colors, you can choose offset print. Offset print just makes whole products use offset print. Nevertheless, you can’t combine with other crafts. At GS-JJ, there are extra fees needed to be paid. The condition of transfer print is almost the same as the silkscreen. Transfer print usually is used in products with gradient ramp. In addition, when your products have more complex color, you can also use it. 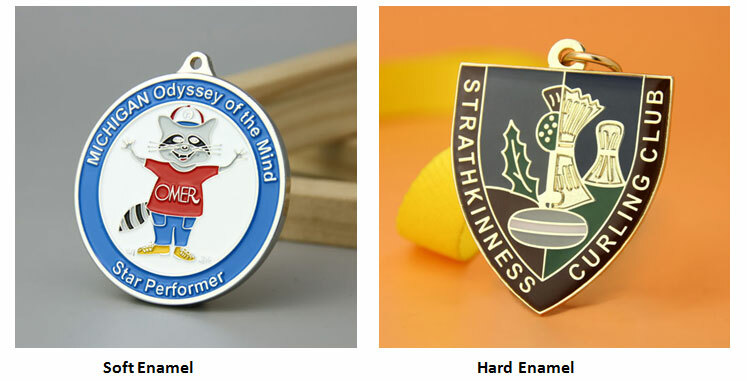 The kind of print are used less in custom medals, but are widely used in custom lapel pins. When your products can not adopt coloring and printing, GS-JJ will suggest you use epoxy sticker. In this way, your products can better present your complex LOGO details and color. Of course, if it is a part of complex designs, we can also use epoxy stickers and stick it again, making epoxy stickers in combination with any other process. Epoxy stickers are an excellent inexpensive choice to resin and glass domes when wanting to create a clear domed effect over an image. 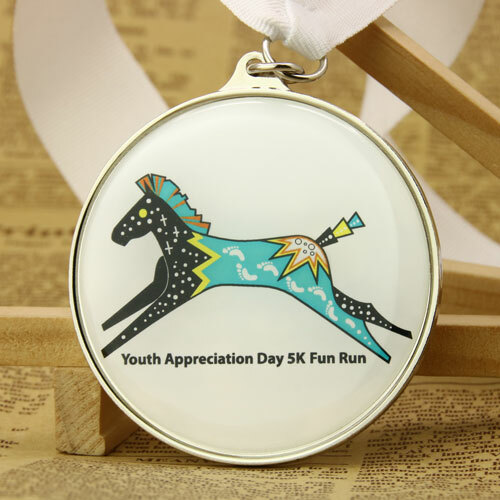 Epoxy sticker sometimes are used in customizing medals.